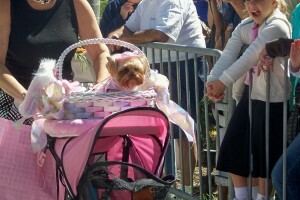 Into the Easter week-end, Delray is making sure that its visitors have plenty to do. Thursday, 4/1/10, Friday, 4/2/10 and Saturday, 4/3/10 – Shark Feeding at 10:30 a.m. at the Sandoway House Nature Center located on 142 South Ocean Blvd., right there on A1A. Friday, 4/1/2/10 – Gallery Walk from 7 p.m. until 10 p.m. on Atlantic Ave. and NE 2nd Ave. Downtown galleries, art studios and showrooms open their doors to the public for an evening of art, music and refreshments. Saturday, 4/3/10 – Green Market from 8 a.m. until 1 p.m. in the street on SE 4th Ave., 1/2 block south of Atlantic Ave. This is a local market, offering fresh and organic produce, flowers, plants, pastas, baked goods and so much more. More info? Please call 561-276-7511. Saturday, 4/3/10 – 18th Annual Egg Hunt from 8 a.m. until 9 a.m. at the Seacrest Soccer Complex located on 2505 N. Seacrest. Blvd. Directions to the complex are: If you are on I-95 exit at Atlantic Ave. and go east on Atlantic. Turn left on Swinton. Go north on Swinton to the yellow blinking light at George Bush Blvd. Turn right, continue on George Bush Blvd., and then turn left at Seacrest Blvd., which is the first traffic light. Go about 1 1/2 miles north to the Complex, which will be on your right. Enter via the entrance just north of Aqua Crest Pool and drive to the back. For information, please contact Danielle Beardsley at 561-243-7277. Children 1 – 8 are invited to bring their baskets and help Delray Beach Parks and Recreation hunt for over 10,000 eggs filled with candy and special prizes. Volunteers are needed to help stuff eggs. Call the above mention number if you would like to help. 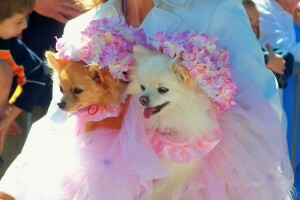 Saturday, 4/3/10 – One of my favorite events and one that I will miss this year is the Easter Bonnet Pet Parade. Register at Old School Square at 9 a.m. and the parade will start at 10 a.m. There is a $2.00 registration fee. 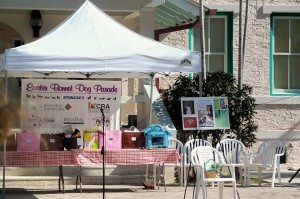 This event is to benefit the animal rescue force. Judging and prizes in various categories will be awarded. Saturday, 4/3/10 – Artists in the Park. 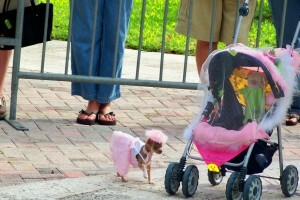 It is Delray Beach Art League Fine Art Show and Sale. Location: Veterans Park Atlantic Ave., at the Intracoastal Waterway. Sunday, 4/4/10 – Happy Easter!!! Sunrise Service at 6:30 a.m. on the Beach A1A and Atlantic Ave.
Sunday, 4/4/10 – From 3 p.m. until 4:30 p.m. at the Old School Square, 51 N Swinton Ave. 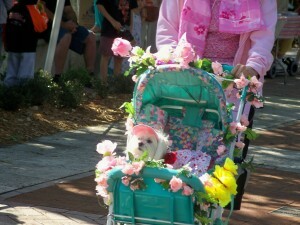 Residents and pets follow the Easter Bunny & Dixieland Band in stroll. Jelly bean contest, refreshments, prizes for best dressed in various categories. Have a wonderful Easter week-end! !….Talk to you later. This post on my blog is completely away from my beaches. 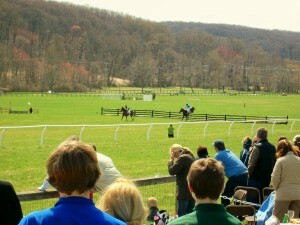 It is the second time I have attended the Greeen Spring Point-to-Point races. Last year the weather was not good but we enjoyed it anyway. 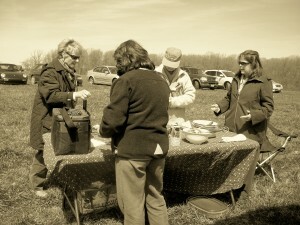 Last Saturday, a chilly day, but off I went with Shelley to meet Susie, Peggy and Betsy in Maryland. From the beaches we brought crabmeat and Fisher’s Popcorn. Upon arriving at Shawan Downs which is in Cockeysville, Maryland I forgot how hilly the Maryland countryside is. After being in Delaware, which is such a flat state, I was getting butterflies in my stomach as I was going up and down the hills. But, it really was a beautiful day. 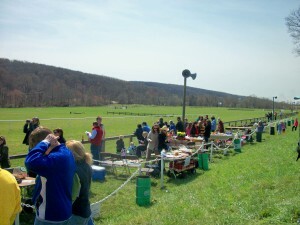 This was the 9th annual running of the Green Spring Valley Point-to-Point. 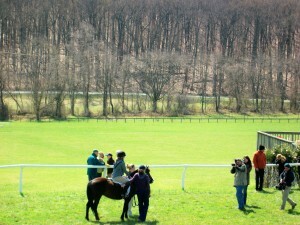 There were pony races, a junior and senior field master’s, chase and timber races. A post race reception was held under the tent. 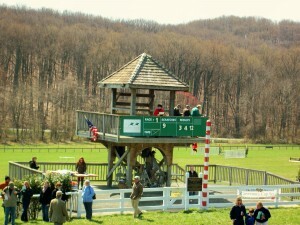 The proceeds from the event were to benefit the Green Spring Valley Hounds. We were all bundled up and it was so much fun to get together with these women. They all knew a lot about steeplechasing; I did not, but nevertheless I got into the excitement of each race. 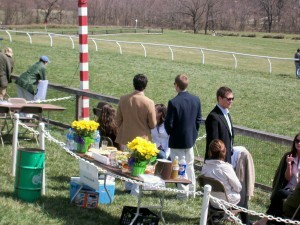 The point-to-point was held at Shawan Downs on 1401 Shawan Road, Cockeysville, Md. The website is http://www.shawandowns.org. 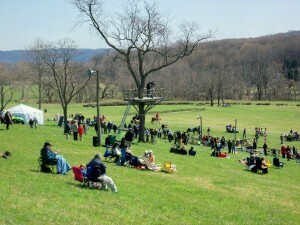 Shawan Downs, is located in Northern Baltimore County. 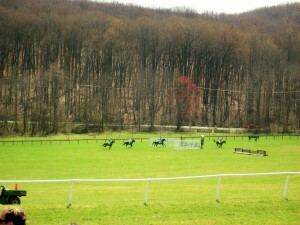 It is a premier equestrian center, featuring a state of the art steeplechase course. It is situated on 300 acres of what used to be farmland in Cockeysville. 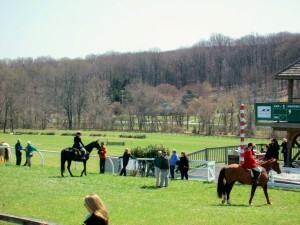 Established by the Land Preservation Trust, Shawan Downs was founded to preserve the landscape’s agricultural legacy while building a new tradition of equestrian events that benefit local charities. No new residential development will be allowed. 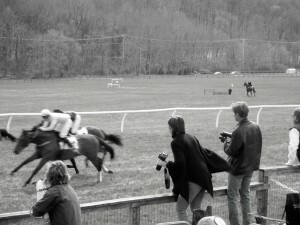 Point-toPoint races originated in England in the 19th century, just like they did in the United States. The purpose was to keep hunters fit and were first called hunt races. 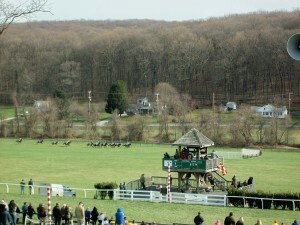 In the U.S. the races were mainly in the fox-hunting country along the Atlantic Coast. The governing body is the National Steeplechase and Hunt Association. 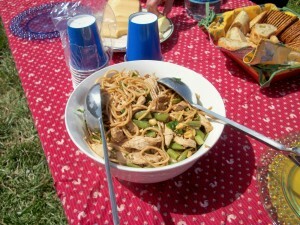 Of course, spending the day outdoors will make anyone thirsty and hungry. We had champagne, and wine, and, we actually had a lot of food with us, including an Asian Noodle Salad, cheeses, the crabmeat and popcorn above mentioned and the Maryland cookies called Berger cookies. 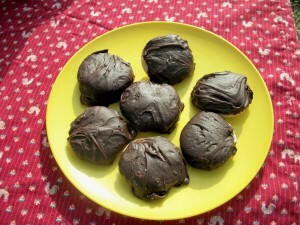 Berger Cookies are a local delicacy. They are yellow cakey cookies with a thick layer of fudge on top. In 1835 two brother named George and Henry Berger arrived in the U.S. from Germany. Henry was a baker and live in East Baltimore. He had 3 sons. Each of them opened their own little bakery. 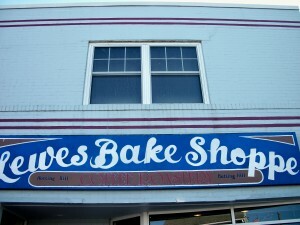 The bakery grew from its modest roots to the most recognized cookie in the Maryland region; same recipe with a few minor adjustments. You can find the Berger cookies at the Lexington Market where there is a location across from Polock Johnny’s and at Royal Farm Stores and probably, at Giant, as well. Between races we people watched and enjoyed all the dogs and puppies playing around. A group of young men and women had their table set up with flowers, deviled eggs, shrimp and a drink that I had never heard of called Southside. A conversation started regarding the origins of this drink. This drink was almost exclusively served once at private clubs but it is been public for quite some time. Some of the more recognized bartenders at the Elkridge Club and Green Spring Valley Hunt Club, in Maryland, probably started making it over 40 years ago. It is made with mint, citrus juices and a few of their own secrets. The secret to a perfect Southside is that it should be gorgeous, silky and refreshing and you can only obtain this by pulverizing the entire mint, cutting stems as well as leaves. The stems have the flavor. That’s the secret!! Note: Information for this post was taken from: http://shawandowns.org, http://articles.baltimoresun.com, http://bergercookies.com, and www.britannia.com. Great day spent with friends….what could be better? 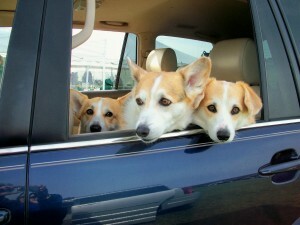 Watching a few spectators of the canine kind…. That’s too bad I could not find anyone to go with me to a wonderful evening at the Milton Theatre on Friday evening. The previous week, my friend, Debbie, and I attended the film Hands on Harvest at this same venue and were taken over by the beauty of this art deco theater. I really wanted to go and take some pictures of the inside of the theater. I contacted the Theatre and Ellen Passman called me and informed me that there was a performance on Friday that I should not miss; to come a little earlier so that I would be able to take the pictures for my blog. 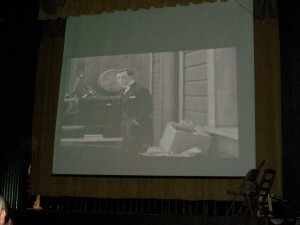 The performace on Friday was a live on-stage and vaudeville-themed murder mystery. 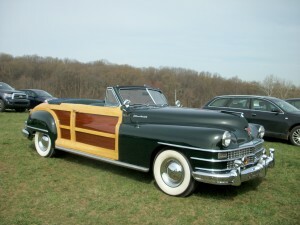 Ellen wrote it and was also starring in it along with the Delaware Commedy Theatre performers. The Delaware Comedy Theatre, Improve Comedy was started in 2005 and it is a non-profit theatre company. 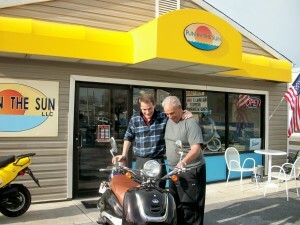 They are located on 131 Glade Circle West, Rehoboth Beach, DE 19971. 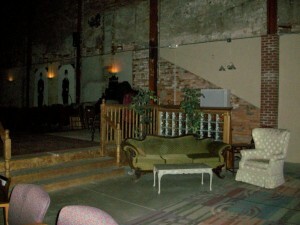 Website is www.delawarecomedytheatre.com. Ticket Hot Line 888-446-7763 and for classes, workshops, and booking info. you may call 302-258-5443. 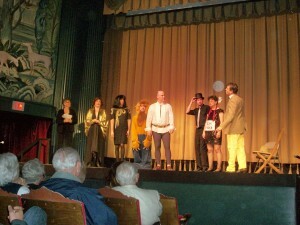 I can tell you that on Friday’s performance of the Mysterious Madcap Murder at the Milton Theatre, the “characters” were quirky and hilarious, mingling and interacting with the audience as they stayed in character, as well; that was part of the fun. Some of the people in the audience really got into it, and solving the murder we did. This wonderful evening of mystery was to help support the Milton Theatre. 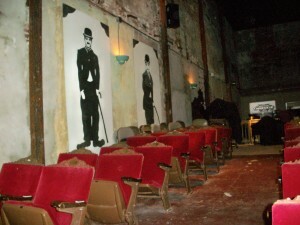 Vaudeville was one of the most popular types on entertainment in North America from the 1880’s until the early 1930’s. The performances were separate, unrelated acts grouped together on a common bill. It came to be called “the heart of American show business”. 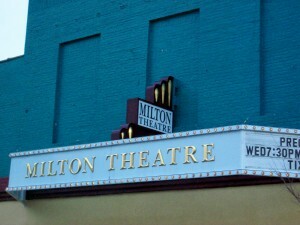 The Milton Theatre is in the heart of the historic district in Milton. It was built in 1910, and it is listed on the National Register of Historic Places in Milton. 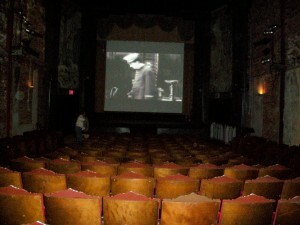 Back in the 1930’s it was the community’s celebrated art deco movie house, featuring silent films, and then, “talkies”. 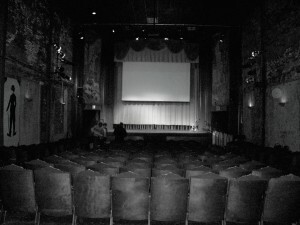 When you enter this theater, and before performances or movies start, there will be continued showings of silent movies, and “talkies”. What was so wonderful to experience was how the audience was truly laughing. And, at a time when we have so much violence and drama shown in films, it was such a nostalgic feeling to experience a good belly laugh, that I just enjoyed the moment. The silent films, had no sound, or broken dialogue. The acting and dialogue were expressed through muted gestures and pantomime. “Talkies” followed and these were talking pictures; exclusively shorts. The first talking film was The Jazz Singer, released in 1927. The ticket office at the Milton Theatre is inside and there are no computers; just a cash box. It is very affordable whether it is a movie, documentary or live performance. 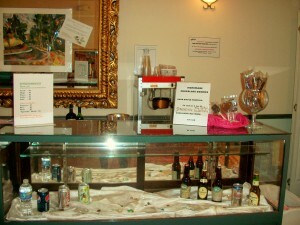 One of the interesting aspects when attending anything at this theatre is that besides the usual soft drinks, you are able to purchase beer and wine, along with candy and other movie treats. On Friday night’s event there was a 50/50 raffle during intermission. The winner, graciously donated her winnings to the theatre. 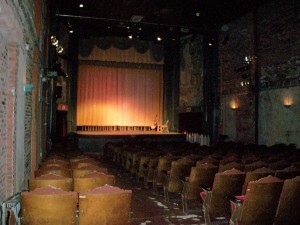 The Milton Theatre has entertaining stage productions, dedicated to promoting the arts, and most of all making their productions accessible to the community. This art deco movie house has been rescued from ruin and it has gone through, and is still on going, a revitalization process with a lot of work, dedication and love from the community, who are all volunteers. It has endured the tests of time; 3 major fires and many nor’easters. It is a community center for many events and is re-emerging as a destination attraction for a fast-growing arts community. Note: Information for this post was taken from the www.miltontheatre.org, and http://en.wikipedia.org. Have a good evening. See you at the Milton Theatre some time….It is only 25 minutes from Rehoboth Beach, going north. Talk to you later…. You must be thinking that I must be nuts thinking about food at 11:20 p.m. on a Friday night but I was just thinking what could I make this week-end since I was going to be out and about; like in Baltimore, for the day. On a chilly week-end this pasta dish might be considered comfort food but even though it might sound heavy, you will be surprised how tasty it actually is. In a large bowl, combine Brie cheese, sundried tomatoes, tomatoes, olives, garlic, basil, pepper and olive oil. Cover and let it sit at room temperature for about 2 hours. Drain pasta and immediately toss with tomato mixture. Serves about 5 to 6 people. Remember to always make it your own and enjoy it!!! Talk to you later…. 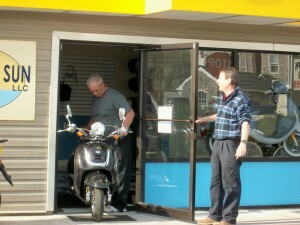 I have been watching the renovation of a shop in Rehoboth. As you are coming into town from Rt. 1 it will be on your left hand side. You cannot miss it because its bright colors and catchy name, perfect for the relaxed atmosphere of the beaches will get your attention. Until today, when I saw the colorful scooters outside, I did not realize what kind of shop it was. Of course, I had to stop in to check them out. Literally, they just moved in. Not all their inventory is there but let me give you their information. 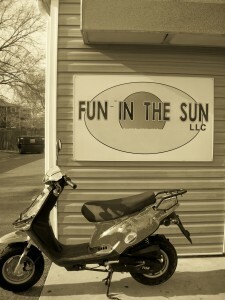 The name of the shop is Fun In The Sun, Scooter Rentals, Sales & Service, 37229 Rehoboth Ave. Ext., Rehoboth Beach, DE 19971. Tel. 302-227-4878. 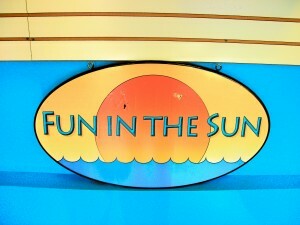 The e-mail address is beachfuninthesun@aol.com. 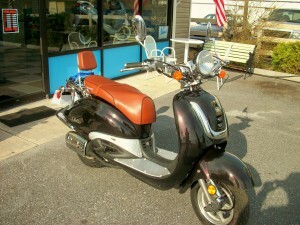 Gary L. Smith is the Scooter Dealer. 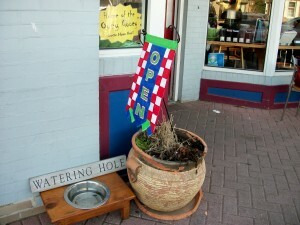 If you have visited Rehoboth in the past years, you probably saw this shop on Baltimore Ave. This shop has been in business since 2005. I think this new location will be perfect and there is parking available. You know how important that is at the height of the summer season. 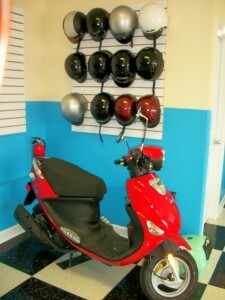 The store has different types of scooters and Gary and the other guys are really friendly. 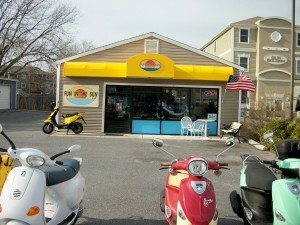 I am sure they can set you up with one that will suit your needs when you are visiting us in Rehoboth. Or, you might even like it so much that you will end up buying one. No sales tax in Delaware!! 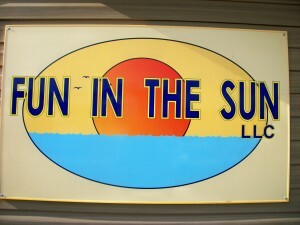 Fun In The Sun is open 7 days a week. At the moment the hours of operation are 8 a.m. until 6 p.m. Later on they will be extended until 8 p.m.
Gary told me the prices for renting the scooters, but have in mind that they might fluctuate a bit, depending on availability. $55 for 4 hours, $90 for 7 hours or $425 for 5 days. 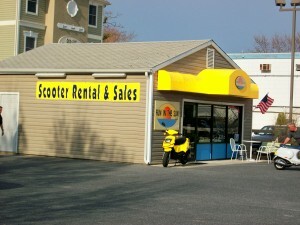 The prices for the scooters that are for sale depend on the model. Your best bet is to visit the shop and talk to them or just call them to the above number or e-mail them for that kind of information. Lots of new scooters are coming in this week. They are just getting organized but check the pictures because they look like they are ready for business. 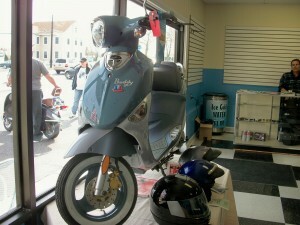 One scooter that attracted my attention was the Buddy 50. 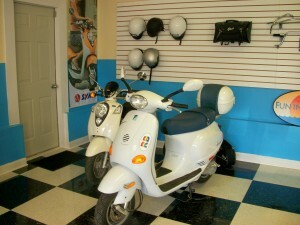 This scooter has a vintage style with modern technology, improved performance and great colors. It already had a sold sign! Another scooter that Fun In The Sun has is called the ScootCoupe. It is a 3 wheeled scooter for recreational use. Two people fit in it and it even has a trunk. They did not have it in the showroom yet but I remember seeing it last year and it looked like a little car. I have never ridden on a scooter but I have been told that they are fun and they provide the riders a feel of the air, a sense of speed and thrill. Want more? I have also been told that they are easy to handle, affordable, fuel efficient, can be parked anywhere, and along with many models to fit individual lifestyles they offer excitement just zipping around. 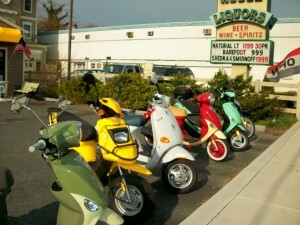 You know, the scooter started in Italy but soon there were scooters from Japan, Taiwan, India, and, don’t you remember when Cosco sold the TN’G which meant “twist and go”? That scooter was from China; now they have their own distribution network. Nowadays, you can buy electric scooters, motorized scooters, min-scooters, maxi-scooters, gas scooters and the list goes on and on ending with a mini Harley Chopper scooter. So, are you ready for some fun? I don’t know, I think I am a scary cat…Talk to you later…. Note: Some of the scooter information was taken from www.thehistoryof.net/the-history-of-scooters.html. Once again, I will have to repeat that some say passion is your key to success and others say that if you love what you do then you will never work a day in your life. Nobody was in the shoppe when I came in and it was around 4:15 p.m. They were closing at 5 p.m. In a few of my past posts I have mentioned the winning dispositions of some business owners. You know from the moment they look at you that they are friendly; a smile says it all. 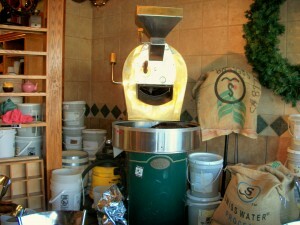 And, that is just what happened when I met Amy Felker who is the owner and roaster of Notting Hill. I only met her briefly but that is all it took. She has been known to say “Most people don’t like what they do, but I love what I do”. That is her passion! Notting Hill is located in the center of Lewes, Delaware, right on 124 Second Street. Tel. toll free 888-99-Latte or 302-645-0733. Website is www.nottinghillcoffee.com. E-mail address is amy@nottinghillcoffee.com. 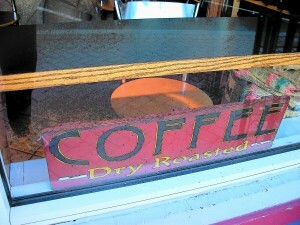 Notting Hill started with a partnership but since 2003 she has been the sole owner and roaster. She roasts herself every single bean. You know, coffee roasting is a chemical process by which flavor components are either created, balanced, or altered in a way that augments the flavor, acidity, aftertaste and body of the coffee. 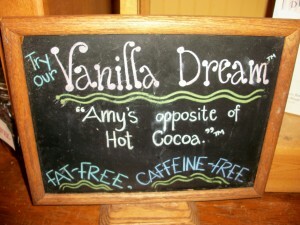 A lot of Amy’s flavors and all of her blends are owned by her; they are unique and you will not find them anywhere else. 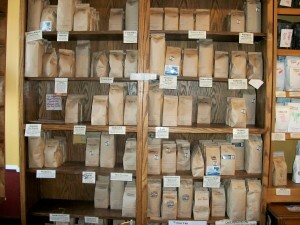 So, after Amy roasts her beans then they are bagged. All bags are stamped by her and her staff. Notting Hill distributes wholesale, as well. 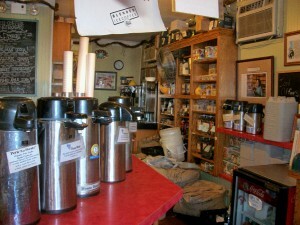 Amy can make thousands of different beverages at the shop and more than 135 different types of coffee are on the shelf. 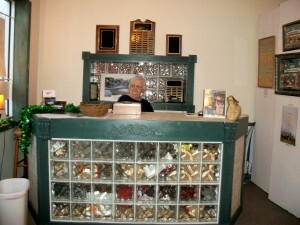 She really runs the day to day operation of the shoppe. Depending on the year, she can sell 25,000-40,000 lbs. of coffee. Coffee has been enjoyed for hundreds of years. Business and coffee go hand in hand. It is a favorite around the world and has been for a long time regardless of how or where it is served. That tiny bean is responsible for the employment of thousands of people. Notting Hill is a very warm and cozy coffee shop. But there are so many other delectables sold here. 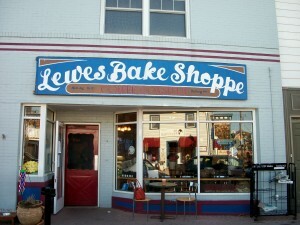 You should know that just like the coffees, all baked goods and soups and sandwiches are baked or cooked in the shoppe. 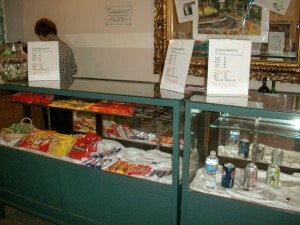 The shoppe opens at 7 a.m. until 5 p.m. During the summer season there will be extended hours. 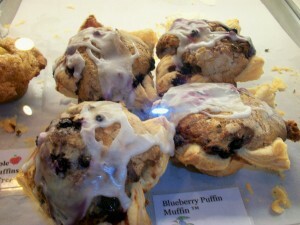 Some customers come for specific baked goods like the Blueberry Puffing Muffin, which is like a blueberry muffin inside a pastry. Just check the picture yourself. Another favorite is the Ooey Gooey which is a long twisted cinnamon pastry with cinnamon and sugar. I did not see one, but I can see it being similar to a Spanish churro, if you have ever had one, except this one is twisted. 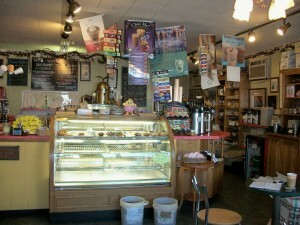 You can find cookies, muffins, scones; everything that goes well with coffee. 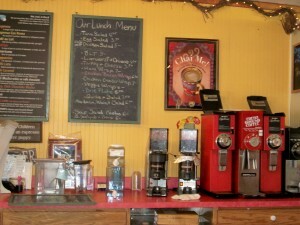 But, coffee is not the only beverage served here; there are smoothies and blended iced teas, as well. 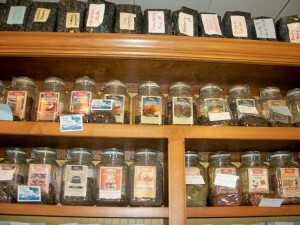 There is a great assortment for the tea drinker. 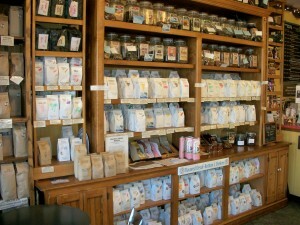 Loose teas to be bought to take home or just to be enjoyed sitting in one of the tables inside the shoppe, while you read one of the newspapers available for the customers. 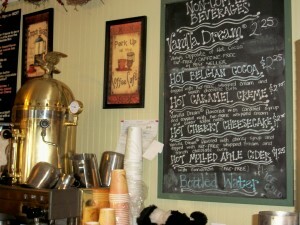 On the Board you will find an Espresso Menu, as well as a Menu consisting of the daily offerings. Another small board will announce the Organic Java of the Day. And a third board will be a Cocoa Menu with all kinds of cocoa drinks, even sugar free ones. The whole time I was there, Linda, who also works at Notting Hill was busy getting ready to close for the day, but customers started to come in and she graciously took care of them. As I was sitting sipping my coffe I started to remember the Puerto Rican coffee that was always so well known, and all the coffee plantations around the island, now Paradores or Inns. Some of the coffees from Puerto Rico are Cafe Yaucono, Cafe Crema, Cafe Rico, Cafe Pilon, Yauco Selecto and Cafe Alto Grande. Puerto Rican coffee is rich and full-bodied. A few things worth mentioning are: Some of the coffees available at Notting Hill are bird friendly, Smithsonian certified and Rainforest Alliance certified. You should really visit the website above mentioned. You can place orders, check what they have besides coffee and most of all get a sense of what Amy is all about. 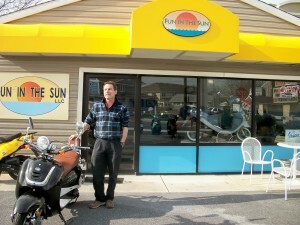 If you are visiting our Delaware Beaches check this shoppe out. Their new omelette in a muffin will be making its debut soon. As Notting Hill gets into the month of April they are so excited since April 30th will be their 20th anniversary. Congratulations!! That’s all for tonight…See you and talk to you later…. Update received from the MERR Institute, Inc. regarding the findings after performing a necropsy on the Fin Whale that washed up this past week-end on the beach in Fenwick Island. This information is from a member of the necropsy team. It was only 20 years old, and weighed at least 100,000 lbs. The whale appears to have died from a blunt force trauma, most likely a boat strike. “To the public that traveled to see this amazing creature, thanks for supporting MERR’s efforts in understanding more about the marine mammals and sea turtles that visit Delaware’s coastal waters.” If you would like to see my post and pictures regarding the fin whale just scroll down to the 3/21 post on this blog. Events and activities at the beaches are increasing. A good sign that the summer season will be upon us in no time. Pretty nice events going on, so check them out. Wednesday, 3/24 at 7:30 p.m. and Sunday, 3/28 at 2 p.m. is the film Precious: Based on the novel Push by Saphire. This will be shown at the Milton Theatre located on 110 Uniion Street, Milton. Tel. 302-684-3400. 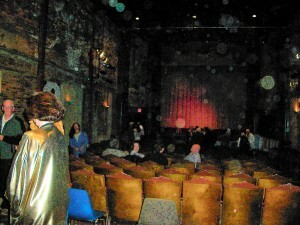 Website www.miltontheatre.org. The town of Milton is north of Lewes and it is very easy to get to. If you have never been to this theatre you really should try to attend at least one of the many events that are held there every week. Check the website for more information. I just went for the first time with my friend, Debbie, last Friday to see Tindewoks and Hands of Harvest, part of the Delmarva Roots series featuring films about the history of the Delmarva region. The movies were fantastic and the theatre is just beautiful. 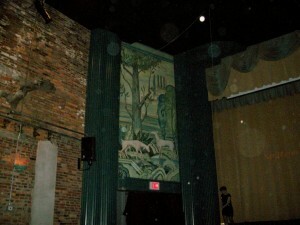 The Old Milton Theatre was a state of the art, art deco movie house. Rescued from almost ruin, it has been revitalized to operate once again. Precious received 6 nominations. 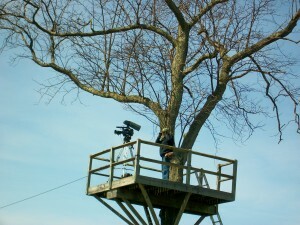 The film will be sponsored by Lavender Fields Farm in Milton. Tickets are $5.00. 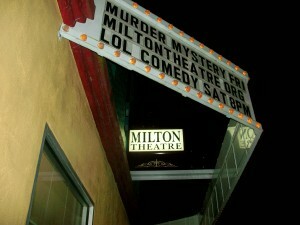 Friday, 3/26 also at the Milton Theatre, located on 110 Union St. in Milton, at 8 p.m. is Delaware Comedy Theatre-Murder Mystery “The Mysterious Madcap Murder at the Milton Theatre”. Live on their stage, a vaudeville-themed murder mystery. An evening of laughs and merriment. One victim, so many crazy characters with a motive. No, the butler didn’t do it!! The audience is invited to help solve the case. Tickets are $15; $12 for Seniors (over 65) and students (under 18). 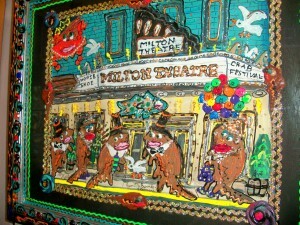 For more information please visit www.miltontheatre.org. Friday, 3/26 The Monthly Screening: Some Mother’s Son at 7 p.m., upstairs at the Movies at Midway, on Coastal Highway, (Rt. 1) sponsored by the Rehoboth Beach Film Society. $2 for RBFS members (membership card required) $4 for non-members. 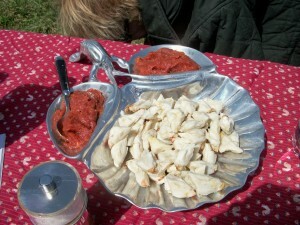 Complimentary Irish appetizers courtesy of Stoney Lonen in Rehoboth will be served from 6:30 to 7 p.m. Some Mother’s Son is a 1996 drama based on actual events from 1981, when Irish Republican Army prisoners in Belfast’s Maze Prison staged a hunger strike to protest against British political policies. This fictionalized account focuses on two of the srikers’ mothers, portraying the “Troubles” of Northern Ireland on a purely personal level. Doors open at 6:30 p.m. Following the screening, Film Society Board of Director member, Sharon Miken will lead a discussion about this. Friday, 3/26, Saturday, 3/27 and Sunday, 3/29 Writers at the Beach: Pure Sea Glass Writer’s Conference. It is at the Atlantic Sands Hotel in Rehoboth Beach. Workshops, discussions, readings and book signings. Keynote speaker will be Steve Luxemburg, author of “Annie’s Ghosts: A Journey Into a Family Secret”. Registration will be $250. One hundred percent of the net proceeds will go to Nemours/Alfred I. duPont Hospital for Children, Wilmington, Delaware, to help families with children with mitochondrial disease. For info. please visit www.writersatthebeach.com. You should know that Writers at the Beach: Pure Sea Glass was founded in March of 2005 to raise money for, and awareness of, a little known disease that affects as many as 1 in 2000 children. Mitochondrial disease. Diseases of the mitochondrial appear to cause the most damage to cells of the brain, heart, liver, skeletal muscles, kidney and the endrocrine and respiratory systems. Please visit the website of The United Mitochondrial Disease Foundation www.umdf.org. Writers at the Beach is about helping others to tell their stories. Please, do visit the website as it is a very personal story. Saturday, 3/27 Young Life 5K Run & 1 Mile Walk. 3.1 mile loop course through historic and country side Milton, Delaware. It is the 2nd Annual Young Life Coastal Sussex County 5 K Run in cooperation with the Seashore Striders. Where? Start/Finish Mulberry St. by Wagamons Pond. To register on line and receive more information go to www.active.com (Left corner type in date and town name). Need more info? Please call Debra Spellman at 302-542-8640. Saturday, 3/27 at 8 p.m. and also at the Milton Theatre, located on110 Union Street in Milton. Hmm, this little town is having some action this week. It is LOL – A Spring Icebreaker. Join them for a comedy night and celebrate the end of a very long and cold winter. Just for the fun of it, you can participate in this lively evening of laughs co-sponsored by Delmarva Broadcasting. Tickets are $10, ($12 at the door that night). 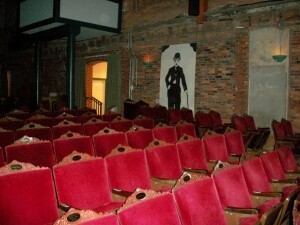 For more information, please visit www.miltontheatre.org. Saturday, 3/27 Exhibit Opening “Spring and Summer Moods” at Peninsula Gallery. This is the work of Tricia Cherrington Ratliff. Exhibit will run until April 24th. 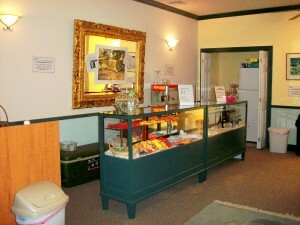 Peninsula Gallery is located at 520 E. Savannah Rd. in Lewes, just across from the canal bridge. On Saturday, 3/27 there will be an opening reception to meet the artist from 5 – 7 p.m. The show may be previewed on the website www.peninsulagallery.com. Saturday, 3/27 and Sunday 3/28 in Rehoboth Beach is the 13th Annual Delaware Resorts Home Expo at the Rehoboth Beach Convention Center on Rehoboth Ave. There will be over 50 exhibitors; realtors, builders, home service companies, etc. Saturday from 9 until 6 p.m. and on Sunday from 10 until 4 p.m. This is a benefit for Sussex County Habitat for Humanity. It is Free. More info? Please visit www.rehobothtoday.com/expo or you can call 302-645-0225. I think this is all for tonight, so, I will talk to you later…. For a small Village by The Sea, Delray Beach, Florida can show its visitors a good time and this coming week is going to be a lot of fun. 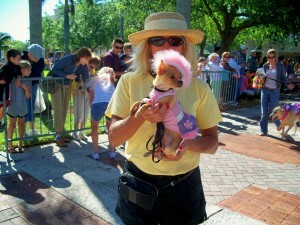 Monday, 3/22 through Sunday, 3/28 is the 5th Annual Delray Beach Film Festival and Market 2010. There are 200 films, 2 workshops daily, parties, sporting events, student films, networking for filmmakers, distribution and film financing workshop, and so much more. You can call 561-381-3212 or visit www.dbff.us. This year the Creative Chair of the festival will be Barry Bostwick. Remember him? He was best known for his role as Brad Majors in The Rocky Horror Picture Show. The other stars that are to receive the 2010 Lifetime Achievement Awards are Sharon Gless, from Cagney & Lacey and Burn Notice and Jessica Walters of Play Misty for Me and Arrested Development. Mercedes Benz has partnered with the Festival. They will be donating a new Mercedes for the winner of the Hole in One Contest during the golf tournament on Thursday, 3/25. Local golf threesomes are partnered with a film industry or golf pro to complete the foursome. 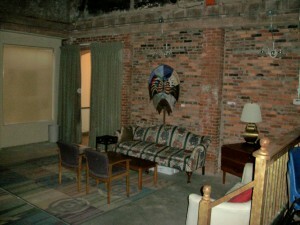 There will be spectacular parties and each night has a designated after party spot. Film lovers are invited to mix and mingle with the cast and crew of the films screenings during the Festival. The Delray Film Festival is a non-profit organization, (501) (c3) and is dedicated to provide the Delray community and its visitors with a diverse presentation of independent films from around the world. 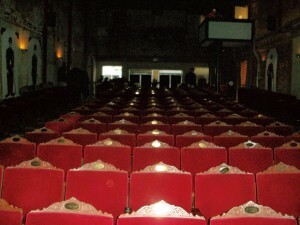 The programming includes: Independent feature films, foreign films, including programming relevant to the community: Spanish language and Brazilian films, Haitian films, Jewish and Israeli films, shorts, documentaries, (including a “green program”) animation, Xtreme sports, children’s films and a day of children’s events. The workshops offered are incredible, free and open to the public. For a complete list of these workshops, and locations, please visit http://www.dbff.us/workshops.asp. Tuesday, 3/23 at Murder on the Beach Mystery Book Store and at 7:00 p.m., located on 273 NE 2nd Ave., Linda Fairstein will talk about and sign her book, Hell Gate, the 12the book in her Alex Cooper series. Linda Fairstein was a prosecutor in the Manhattan District Attorney’s Office for 30 years. The event is free and open to the public, but in order to take a seat, you must purchase a book. 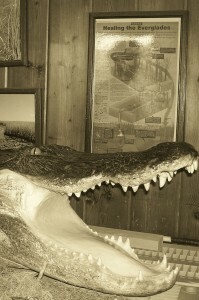 For more information, please call 561-279-7790 or visit www.murderonthebeach.com. Wednesdays, Saturdays, and Sundays, the American Orchid Society, located on 16700 AOS Lane, off of Jog Rd. – The Orchid Doctor is In. If you are having problems with your orchids, blooms are falling off, plants are sick, then you can get answers by bringing the invalid plants to the AOS Visitor’s Center and talking with the “Orchid Doctor”. Wednesdays 10 – 11:30 a.m., Saturdays and Sundays from 1 – 4 p.m. For more info. 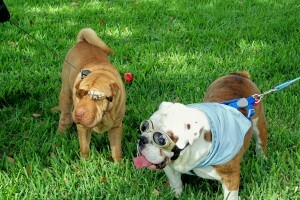 please call 561-404-2000 or visit www.aos.org. Thursday, 3/25 Robert Osborne will be at the Crest Theatre, Old School Square. Lecture series features one of the most recognizable TV personalities today and Robert Osborne is also one of America’s foremost film historians. 2:00 p.m. and tickets are $25 and $40. Location 51 N. Swinton. Tel. 561-243-7922, ext. 1 or please visit www.oldschool.org. Friday, 3/26 is the Gallery Walk on Atlantic Avenue from 7 – 10 p.m. The downtown galleries, art studios and showrooms open their doors to the public for an evening of art, music, and refreshments right on the Avenue. Saturday, 3/27 – Just like every Saturday, The Green Market will be from 8 a.m. until 1 p.m. in the street on SE 4th Avenue, 1/2 block South of Atlantic Ave. This is a local market and you will find fresh local produce, organic produce, flowers and plants, pasta, hummus, fresh baked breads, pastries and desserts, and handmade Italian cheese, among others. For more info. please call 561-276-7511. Email address: greenmarket@delraycra.org. Saturday, 3/27 at the Pineapple Grove Arts District, off of Atlantic Ave., NE 2nd Ave. is Take it Easel from 10 a.m. until 4 p.m. There will be music, children’s craft area, easels and artists, and all this is on the sidewalks. Need more info? Please call 561-279-1380, ext. 36. Saturday, 3/27 is the Narrated Bus Tour of Historic Delray Beach. It is conducted by the Museum of Lifestyle & Fashion History. Duration: 1 hour and 45 minutes; you will be visiting 10 historic sites. $15/adult/senior citizen, free for children under 18. 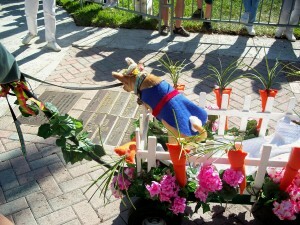 11 a.m. departure from the Delray Beach Public Library, 100 W Atlantic Ave., 561-243-2662. 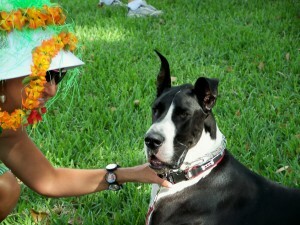 You can also visit www.delraybeachbustours.org. Note: Please be prompt. Saturday, 3/27 and Sunday, 3/28 is the Asian Food Fair & Cultural Show at the Old School Square Entertainment Pavilion. Continuous live Asian music and dance, arts and crafts, costumes, food and children’s activities. This event is presented by the Bangladesh Association of Florida. $10 admission. 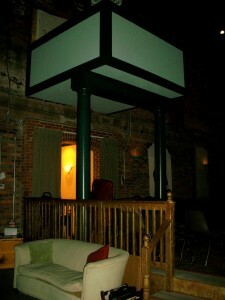 Location: 51 N. Swinton Ave., Tel. 561-351-5019 or 561-876-2255. Website www.asianfair.org. Sunday, 3/28 is the Delray Beach Chorale. Freedom: The American Dream. The music of American composers, traditional American spirituals and more. Location is the First Presbyterian Church, 33 Gleason St. at 4 p.m. Tickets $20/person; $5/students. Tickets are available at the door. Please call 800-984-7282 or visit the website www.delraybeachchorale.org. The Delray Beach Chorale has been performing music in the South Palm Beach County since 1982. The Chorale has about 70 members and performs 2 major programs a year; winter and spring. Have a great time!! Talk to you later….